On my latest travels in Malaysia one thing that struck me was the amount of Frangipani trees, they were everywhere I went, the tree is very distinctive and has an understated charm about it, slightly crooked shaped branches, large green leaves with a rich leathery texture and bundles of at least 20 frangipani flowers in an array of co-ordinated colours exuding a very distinctive and pleasant aroma for everyone to enjoy. When I felt the texture of this precious and alluring flower it seemed to again have a slightly leathery feel about it and it comprised of five petals per flower. 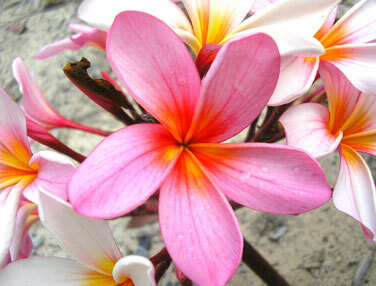 My understanding of Frangipani is that there are over 290 recorded varieties. Plumeria rubra is a common Frangipani which is also classed as Red Frangipani and grows with ease across the sub-continent, most Malays I had the pleasure to meet actually grew this in their gardens and when the flowers are in full bloom it is a tree of true beauty. The flowers are fascinating and stimulating, initially deep pink on opening, with a strong orange tinge running throughout the centre of each petal. The orange colour slowly fades over a few weeks, along with the intensity of the pink colouring, leaving white petal flowers remaining which I’m told signifies the end of these particular flowers. 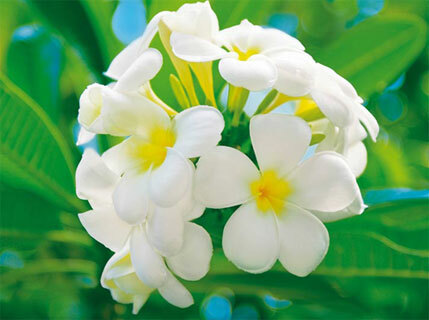 In Malaysia the local people are convinced Frangipani cleanses the air of rotting corpses and keeps the bad spirits from re-entering the world, and that includes Vampires. In Bali it is a Holy plant and people wear the flowers, in fact Bali is the only island to my knowledge where Hindus will gladly offer the flowers.The real pleasure came ultimately from the smell, olfactory heaven as it has everything, it is fresh in a spiritually cleansing type of way, then rich, floral and finally spicy sweet, all delivered to you in stages as you gradually inhale. All easy to detect and register, so addictive I found myself totally indulging in the smell these flowers omitted at every opportunity. It really was such a beautiful smell which put my mind, body and soul in a place of true contentment, I wouldn’t class it as a feminine or masculine scent, I think it’s a scent for everybody. Having returned home to the UK I’m pleased to say that the Frangipani Absolute I sell, gets my true seal of approval. Clearly the absolute is heavily concentrated and initial smell is far more potent, but just applying a single drop to my wrist and as the smell develops over the course of a few hours the Malaysian experience starts all over again. It really is worth mentioning if you want real Frangipani Absolute then remember that the price I pay (and my competitors should pay) is anywhere between 6000–8500GBP per kilo, that equates roughly speaking to a bare minimum cost of 60-85GBP per 10ml as the specific gravity is slighty over 1. Of equal importance is trust, even if my competitors buy at this price, they and I need to be certain as we can be of the supplier. So what is an absolute fact (no pun intended) is that no internet retailer could possibly sell real Frangipani Absolute for less than £75 per 10ml. This takes into account processing fees and good old VAT, which as I write currently stands at 20% of which nearly every retailer will build into the final price you see on their website. Clearly at this price the supplier would not turn a profit either. I mention this because there are so many scandalous UK traders in existence, especially where Frangipani is concerned. As someone who spends heavily buying absolute oils each and every month it would be nice to think my UK competition may raise their standards and play fair. I’m not taking the high and mighty approach, just expressing my utter disgust towards the traders who do not play fair because real damage is being done.